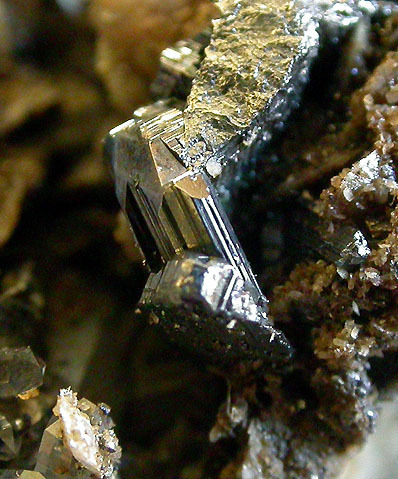 Freieslebenite: Mineral information, data and localities. After Johann Carl Freiesleben (14 June 1774, Freiberg, Germany - 20 March 1846, Niederauerbach, Germany), Mining Commissioner of Saxony, who described the mineral. Compare the chemically similar diaphorite. Quartz 17 photos of Freieslebenite associated with Quartz on mindat.org. Chalcopyrite 9 photos of Freieslebenite associated with Chalcopyrite on mindat.org. Baryte 7 photos of Freieslebenite associated with Baryte on mindat.org. Siderite 6 photos of Freieslebenite associated with Siderite on mindat.org. Galena 3 photos of Freieslebenite associated with Galena on mindat.org. Dolomite 3 photos of Freieslebenite associated with Dolomite on mindat.org. Sphalerite 2 photos of Freieslebenite associated with Sphalerite on mindat.org. Silver 1 photo of Freieslebenite associated with Silver on mindat.org. Freibergite 1 photo of Freieslebenite associated with Freibergite on mindat.org. Gypsum 1 photo of Freieslebenite associated with Gypsum on mindat.org. De l`Isle, R. (1773) Cristallographie, ou Description des formes propres à tous les corps du Regne mineral. Paris Vol. 3: p. 54. Freiesleben, J.C. (1817) Geognostische Arbeiten: 6: 97-101. Haidinger, W. (1845) Zweite Klasse: Geogenide. XIV. Ordnung. Glanze. VII. Antimonglanz. Freieslebenit. in Handbuch der Bestimmenden Mineralogie, Bei Braumüller and Seidel (Wien): 563-570. Zepharovich, M.V.R. (1871) Über Diaphorit und Freieslebenit. Sitzungsberichte der Kaiserlichen Akademie der Wissenschaften, Mathematisch-Naturwissenschaftliche Classe, 1. Abt. : 63: 130-156. Vrba (1878) Zs. Kr. : 2: 153. Palache, C., Berman, H., Frondel, C. (1944) The System of Mineralogy of James Dwight Dana and Edward Salisbury Dana Yale University 1837-1892, Volume I: Elements, Sulfides, Sulfosalts, Oxides. John Wiley and Sons, Inc., New York. 7th edition, revised and enlarged: 416-418. Hellner, E. (1957) Über komplex zusammengesetzte sulfidische erze. II. Zur struktur des freieslebenits, PbAgSbS3. Zeitschrift für Kristallographie: 109: 284-295. Berry, L.G., Thompson, R.M. (1962) X-ray powder data for the ore minerals. Geological Society of America Memoirs: 85: 137. Fleischer, M. (1973) New mineral names. American Mineralogist: 58: 139-141. Ito, T., Nowacki, W. (1974) The crystal structure of freieslebenite, PbAgSbS3. Zeitschrift für Kristallographie: 139: 85-102. Appiani, R., Bogni, G., Gentile, P., Vignola, P., Gruppo Orobico Minerali (1994) Le miniere di zinco della Val Brembana (BG) 2° parte. Rivista Mineralogica Italiana: 1994(1): 33-46. The following Freieslebenite specimens are currently listed for sale on minfind.com. Harris, D. C., Sinclair, W. D., & Thorpe, R. I. (1983). Telluride minerals from the Ashley Deposit, Bannockburn Township, Ontario. The Canadian Mineralogist, 21(1), 137-143. Degeling, P.R. (1982) Wagga Wagga 1:250 000 Metallogenic Map (SI 55-15) Mine Data Sheets and Metallogenic Study. Published by the Geological Survey of New South Wales. Sutton, P. (2012). Paul Ramdohr in Australia: Contributions to Mineralogy, Mineragraphy, Ore Genesis and Meteoritics Resulting from His Three Visits. Historical Records of Australian Science, 23(2), 142-158. Strashimirov, S., Dobrev, S., Stemenov, S., & Dragiev, H. (2005). Silver-bearing minerals from the ore body “North” in Sedefche epithermal Au-Ag deposit (eastern Rhodopes). Annual of the University of Mining and Geology “St. Ivan Rilski, 48, 143-148.; Kerestedjian T, Mladenova V (1998) Spherulits of native arsenic from Sedefche deposit , Eastern Rhodopes. 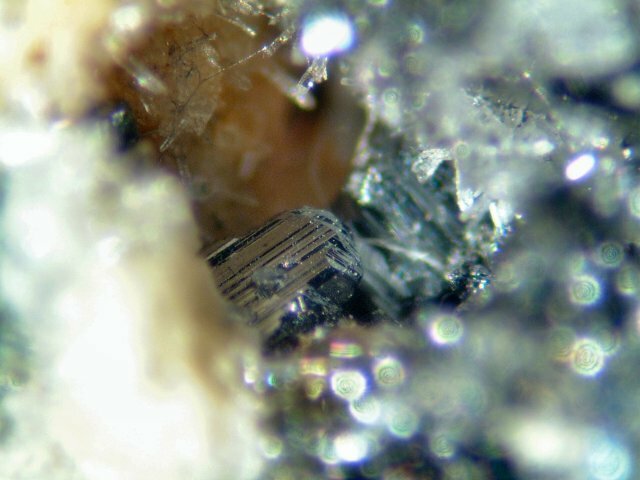 Geochem., Mineral. and Petrol., 34, 27-34.
ⓘ Sedmochislenitsi Mine (Sedmocislenici Mine) ? Woodside, R.W.M., Soregaroli, A.E., Ansell, H.G., Twaites, B.L., Balacko T.W. (2000): Rare sulfosalts from the Van Silver Mine, British Columbia. 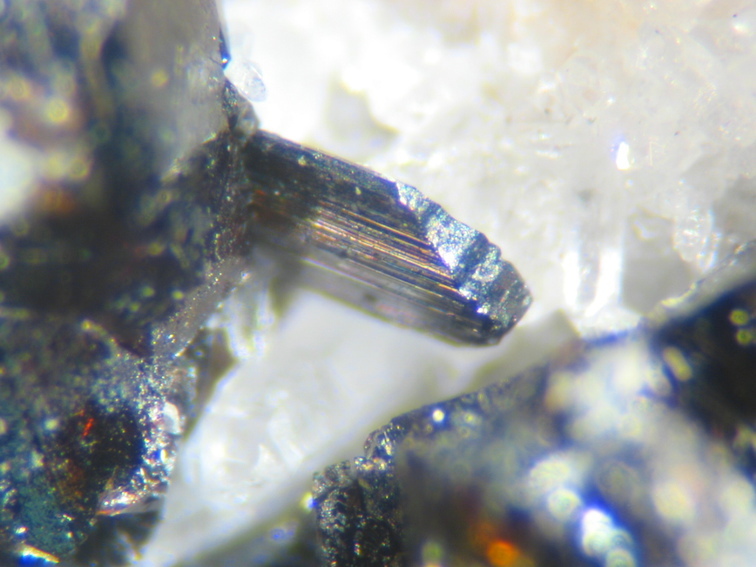 Mineralogical Record, 31(3), 219-229. Healy, R.E. & Petruk, W. (1990) Petrology of Au-Ag-Hg and "invisible" gold in the Trout Lake massive sulfide deposit, Flin Flon, Manitoba. Canadian Mineralogist 28, 189-206. Traill R. J. (1983): Catalogue of Canadian Minerals Revised, Geological Survey of Canada, Paper 80-18. P. 149. Darío Chinchilla, Lorena Ortega, Rubén Piña, Raúl Merinero, Daniel Moncada, Robert J. Bodnar, Cecilio Quesada, Antonio Valverde, Rosario Lunar (2016): The Patricia Zn–Pb–Ag epithermal ore deposit: An uncommon type of mineralization in northeastern Chile. Ore Geology Reviews 73, 104-126. Gröbner, J., W. Hajek, R. Junker & J. Nikoleizig (2011). Neue Mineralienschätze des Harzes. S.89-97. Papierflieger-Verlag, Clausthal-Zellerfeld. Baumann, L., Hofmann, F. & Weber, W. (1997): Glückauf Freiberg. Bergbau, Erze, Mineralien. Bode Verlag Haltern, 168 p.; Sejkora, J., Litochleb, J., Velebil, D. & Plášil, J. (2009): Owyheeit z rudního revíru Freiberg (SRN) a jeho doprovodné minerály. Bulletin mineralogicko-petrologického oddělení Národního muzea v Praze 17 (2), 91-99 (in Czech with English abstract). Kolitsch, U., Rieck, B. and Voudouris, P. (2015): Mineralogy and genesis of the Lavrion ore deposit: new insights from the study of ore and accessory minerals. Poster, MinPet 2015, Leoben, Austria, September 10-13; abstract in Mitt. Österr. Mineral. Ges. 161, 66; Rieck, B., Kolitsch, U., Voudouris, P., Giester, G. and Tzeferis, P. (2018): Weitere Neufunde aus Lavrion, Griechenland. Mineralien-Welt 29 (5), 32-77 (in German). Appiani, R., Bogni, G., Gentile, P., Vignola, P., Gruppo Orobico Minerali (1994): Le miniere di zinco della Val Brembana (BG) 2° parte. Rivista Mineralogica Italiana, 1/1994, 33-46.
ⓘ Yunoura mine (Yunagano mine) ? Wilson, W. and Panczner, C., 1986, Batopilas, Mineralogical Record, v 17: 61-80. Pedro Alves collection and analytical data; A.M.R. Neiva, A. Moura & P.C.S. Carvalh (2015). Metallogenesis at the Terramonte Pb–Zn–Ag quartz vein, Portugal: Geological, mineralogical and geochemical evidences. Ore Geology Reviews, 71:14-28. 1-Rădulescu Dan, Dimitrescu Radu, 1966, Mineralogia Topografică a României, Ed. Academiei RSR, 1966, p.322-323. Marias Francisc, 2005, Metallogeny of the Baia Mare Mining District-an approach based of the Cavnic hydrothermal system-comparison with other epithermal systems in the World. Ed. Cornelius, 2005, p. 376-377. Rogulina, L. I.; Sveshnikova, O. L.; Varlamov, D. A. (2012): Mineral composition and structure of ores of silver epithermal deposit Taezhnoe in Primorye. Razvedka i Okhrana Nedr 2012 (6), 32-39 (in Russian). Slobodan A. Radosavljević, Jovica N. Stojanović, Ana S. Radosavljević-Mihajlović, Vladan D. Kašić (2013): Polymetallic mineralization of the Boranja orefield, Podrinje Metallogenic District, Serbia: zonality, mineral associations and genetic features. Periodico di Mineralogia, 82, 61-87.; Radosavljević, S. A., Stojanović, J. N., Pačevski, A. M., Radosavljević-Mihajlović, A. S., & Kašić, V. D. (2016). A review of Pb-Sb (As)-S, Cu (Ag)-Fe (Zn)-Sb (As)-S, Ag (Pb)-Bi (Sb)-S and Pb-Bi-S (Te) sulfosalt systems from the Boranja orefield, West Serbia. Geološki Anali Balkanskog Poluostrva, 2016(77), 1-12.
ⓘ Bärenleuten (Bärenleitner) vein ? 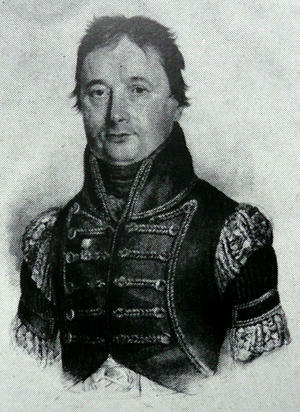 Onačila D., Rojkovičová Ľ. (1992) Zlato-strieborná mineralizácia žíl v hodrušskom rudnom poli. Mineralia Slovaca, 24, 3-4, 245-256 (in Slovak with English abstract). Onačila F., Rojkovičová Ľ., Jeleň S., Hojstričová V., Štohl J., Lexa J., Žáková E. (1995) Komplexná geologická dokumentácia revíru Banská Štiavnica-Hodruša. Manuscript, Slovak Geological Survey (in Slovak). Doblas, M., Oyarzun, R., Lunar, R., Mayor, N., & Martinez, J. (1988). Detachment faulting and late Paleozoic epithermal Ag-base-metal mineralization in the Spanish central system. Geology, 16(9), 800-803. Zepharovich, M. V. R. (1871): Über Diaphorit und Freieslebenit. Sitzungsberichte der Kaiserlichen Akademie der Wissenschaften, Mathematisch-Naturwissenschaftliche Classe, 1. Abt., 63, 130-156.; Calvo, M. and Sevillano, E. (1995): Famous mineral localities: Hiendelaencina Guadalajara Prov. Spain. Mineralogical Record 23, 241-249. Zepharovich, M. V. R. (1871): Über Diaphorit und Freieslebenit. Sitzungsberichte der Kaiserlichen Akademie der Wissenschaften, Mathematisch-Naturwissenschaftliche Classe, 1. Abt., 63, 130-156.; Calvo, M. and Sevillano, E. (1995). Famous mineral localities: Hiendelaencina Guadalajara Prov. Spain. Mineralogical Record. 23: 241-249. Anthony, J.W., et al (1995), Mineralogy of Arizona, 3rd.ed. : 226; Galbraith, F.W. (1947), Minerals of AZ, AZ Bur. of Mines Bull. 153: 29; Lapis: 16(10): 8 (1991). ⓘ Dean Mine (Cumberland mine) ? Gromova, E. I.; Glotov, A. M.; Khrenov, V. A.; Lipskaya, V. I. (1980): Gold-​silver-​antimony mineralization in Charmitan deposits. Uzbekiston Geologiya Zhurnali 1980 (5), 8-11 (in Russian).